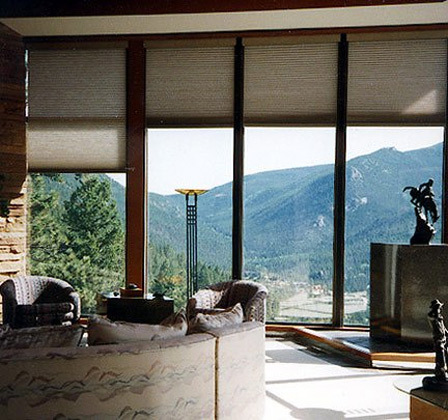 Motorized shades can provide convenience and style, as well as simplying your life. Motorized shades are becoming more and more popular, not only for businesses, but for homes as well. The idea of being able to control your fabric shades without having to get up and hassle with a cord is something that a lot of people enjoy. While motorized sun shades still aren't found frequently in homes, they are beginning to pop up in a lot more places as manufacturers begin to branch out and explore these high-tech and super convenient motorized shading options. Why Buy Motorized Window Blinds? The most obvious benefit to investing in motorized window shades is that they can be controlled remotely much like your television set can be. You don't have to get up and move across your house to adjust them, instead you just quickly push a button on a remote and get back to taking care of more important tasks. Another benefit that people often forget though, is that the lack of a drawstring or cord makes motorized window blinds safer as well. Since there is no dangling cord, there is no worry about children or pets getting tangled up in the blinds or of the cord being tugged on so hard that the blinds actually fall out of place. One of the leading names in window treatments, including motorized shades, is Hunter Douglas. With dozens of styles available and a large percentage of them available in remote operated designs, you are sure to find the perfect set of retractable shades when browsing through their creations. The Applause Double Cell motorized cellular shades are one of their most popular designs. The color selection on this particular line is a little less impressive than with other models, but they will keep your home well shaded and insulated while requiring very little attention since Applause solar shades are made of dust repellant materials. If you are looking for more color variety, Hunter Douglas Duette honeycomb shades are available in dozens upon dozens of colors and offer motorized shade control, various levels of light control and excellent insulation as well. Another popular brand in the world of motorized roller shades is Kirsch who specializes in providing simple and classic designs for the windows in your home. Their Exlite and Moire roll up shades are available in a handful of light colors like vanilla, champagne and alabaster. If you are interested in a roll up style of window coverings like the Exlite and Moire style from Kirsch, it's important to note that you won't get full light blockage unless you mount them on the outside of the window, so that should be kept in mind when taking measurements for any sort of roll up shades. Whether you are looking for a motorized roman shade setting to keep your children safe or to cut down on the amount of time you spend adjusting your blinds, there are a number of options available on the market. From simple plain colored shades to vibrant cellular shades that offer additional insulation, you can add value and style to your home with any of the motorized shades on the market.